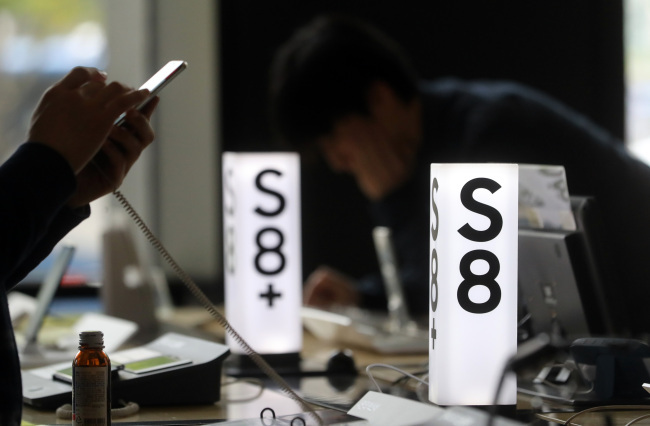 Suspicions about Samsung Electronics’ latest flagship Galaxy S8 and S8+ smartphones are continuously being raised on online communities, with some saying the quality of the handsets falls behind their design. On a South Korean internet community Monday, a Galaxy S8 user uploaded a post showing his smartphone that appeared to have a burn-in on the screen. The writer highlighted it had been just over a week since he started using the new phone. A burn-in refers to a permanent discoloration of a smartphone’s screen caused by irregular pixel usage, especially the prolonged use of static images. It is known to happen more commonly on AMOLED (active-matrix organic light-emitting diode) screens. The post said the burn-in appeared in the lower part of the screen where the pressure-sensitive soft key is built-in, replacing the traditional physical home button. The soft key features Samsung’s Always On Display technology, known as AOD. A question about possible screen burn-ins because of the AOD feature was raised by a Dutch consumer with the Twitter account of Samsung’s Netherlands Office on Thursday. The regional Samsung office had dismissed the concern, saying the company has adopted a burn-in proof technology for its latest devices. Other than the burn-in claim, Samsung’s Galaxy S8 series, which was launched officially on April 21, faced complaints about defects including displays with a red-tint and Wi-Fi connection problems on some sold devices. Amid rising complaints about the quality of its latest handset series, Samsung on Monday officially launched its Bixby Voice service based on deep learning. On Galaxy S8 series models, the Bixby Voice service can execute about 3,000 tasks via 10 applications, including Kakao Talk, Facebook and YouTube, as its artificial intelligence algorithm is designed to understand millions of expressions. Meanwhile, a recent report by market researcher Strategy Analytics forecast concerns about the sales of the Galaxy S8 series due to higher prices than its predecessors. In Korea, the S8 model’s shipment price has been set at a minimum of 935,000 won ($821). Considering the recent trend of consumers turning to mid- and low-priced handsets, the relatively higher prices of the Galaxy S8 models might affect their sales, the report said. Samsung posted its lowest global handset average selling price in almost three years at 204,000 won in the first quarter of this year, due to a higher mix of lower-priced devices, affected by the weakening momentum of S7 devices and no support from the recalled Note 7. The average selling price is about 20 percent lower than a year earlier. Samsung shipped 92.8 million handsets worldwide in the first quarter, making it the world’s top provider, but the figure was up only slightly, by 1 percent on-year, the report added.